HENDERSONVILLE, N.C. — House Freedom Caucus Chairman Mark Meadows represents one of the most conservative districts in North Carolina. Even so, progressive groups are staging protests, a Democrat is already campaigning against Meadows and many people are worried about losing their health insurance under the GOP bill. But Meadows won the district comfortably, and many of his supporters say they still love him. They often told me one of two things: They don't believe the Congressional Budget Office or media reports warning about millions of people losing health coverage, and they're not yet paying attention because the Senate is going to change the bill anyways. The bottom line: Meadows' district is a classic example of people choosing their news: They either don't believe the worst things they've heard about the bill — and they might think anything is better than the Affordable Care Act anyway — or they believe all of the bad things and are up in arms about it. The case for skepticism: People don't know what to think "until you see the end result," Bill Markwat, a Republican who owns a home in the district, told me. While he thinks 23 million people losing coverage "seems like a lot," it's hard for him to figure out what to think about the bill. "The worst part…is how do you validate the number you hear and what do you believe?" What we're watching: According to an analysis done by the left-leaning Center for American Progress, more than 100,000 people in Meadows' district could lose their health care under the House bill. That leaves open the possibility that those who stand by him now could change their mind if the CBO's analysis is correct. Merry Parris Guy, chairwoman of the Henderson County GOP: "I do know there was a lot of — pardon the term — fake news about people losing their insurance, people who were really sick not being able to get insurance. Those things are just not true. 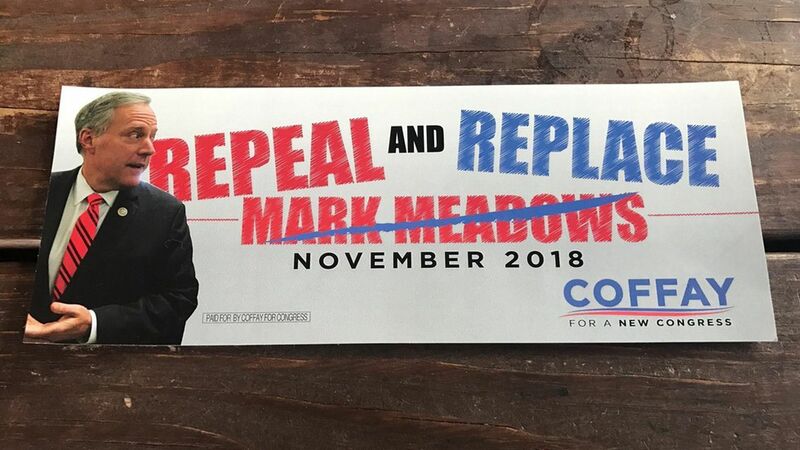 ""Henderson County loves Mark Meadows. He's family." Charlie Westmoreland, a Henderson County Republican: "It's so subject to change." He's read about the CBO score, but: "I read these stories about how they're wrong most of the time, so you take it with a grain of salt. "When Meadows and the Freedom Caucus first blocked the bill, "I would have voted against him right then…now I'm sort of on the fence with him. "But he and his wife, Nancy Sumner, both lost former spouses to cancer. Sumner says they think people with pre-existing conditions should be able to get insurance, "and I don't think [the cost] should be higher." Russell England, a Nebo Republican: "They need to just repeal [The Affordable Care Act]. They need to get out of the insurance business…It doesn't need to be replaced." Ryan Ziegler, who gets insurance from the ACA exchange: "In this area, it is a lot of low-income people….We need health down here…we need something that will actually cover us." Gayle Kemp, who has had cancer and heart failure: "We're from North Carolina…They're going to waive out of everything they can. There's no way I'm going to be able to afford insurance. I'll die."